Before coffee culture and bikes morphed into an espresso coloured kaleidoscope on every corner, you went on a bunch ride then went straight home, no coffee stop. Talk about rapid change, you only have to go back a few years to find there weren’t many choices for Saturday bunch rides in Brisbane. 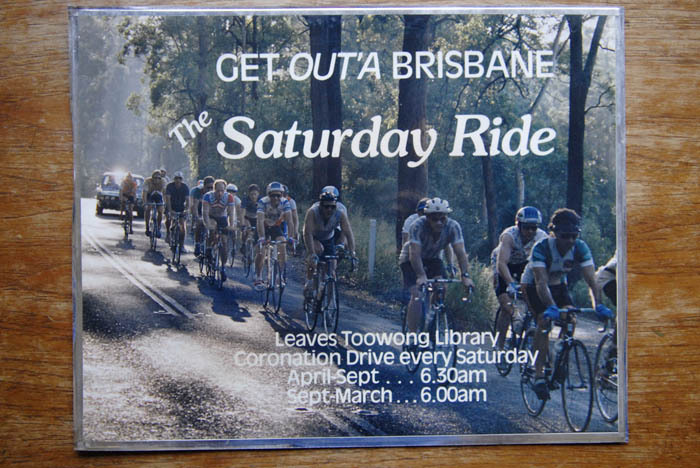 On Saturday’s before the turn of the century, you could meet at the Toowong library for the Brisbane Blasters Cycling Team ride out of town, there has always been the Lifecycle ride, plus a few club runs. If you were fit enough then you’d front up for the Zupp’s ride, the Sunday morning ride, more like an unofficial race in some sections, that still runs around the northern suburbs. Then about fifteen years ago a different kind of bunch began to appear on the roads around Brisbane, a new wave of bike riders who had no affiliation with racing circles. At the same time coffee shops were materalising on every corner, wool cycling apparel had already been relegated to the vaults of history and bicycles took on a new form, steel was momentarily sidelined as passé. Carbon fibre bicycles and components upgrades promised a tantalising new array of toys for bike riders to amuse themselves with. Coffee, carbon and lycra, with a push along the way courtesy of the Cadel phenomenon, all helped deliver this new wave of enthusiasm for bunch riding. Momentum for the uptake of cycling which invariably meant bunch riding, followed a slow curve upwards, culminating in it’s current accelerated state. The irony is now, huge numbers are scrounging about trying to track down old steel bikes that they had forgotten about or discarded, heading for destinations like Gaiole in Chianti doing L’Eroica. Now dirt roads and steel bikes are back in vogue. 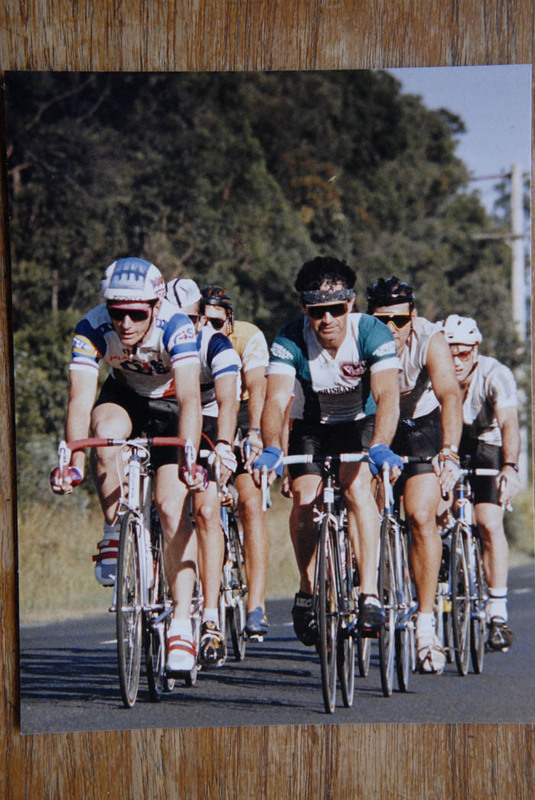 In the 1980’s, usually if you saw another cyclist on the well known Brisbane river loop, chances are you knew them. Back then you could have easily counted the number of bunches circulating around the city. Depending on when you counted, the Blasters ride would contain between thirty and say fifty riders and on some occasions upwards to a hundred. Now most days of the week, on any road in Brisbane, you’ll find innumerable masses of lycra clad, carbon obsessed, coffee drinking two wheeled devotees. It’s great to see so many people enjoying the simple pleasure that bike riding can bring, yet some of the unruly bunches haven’t created a great impression for cycle sport. 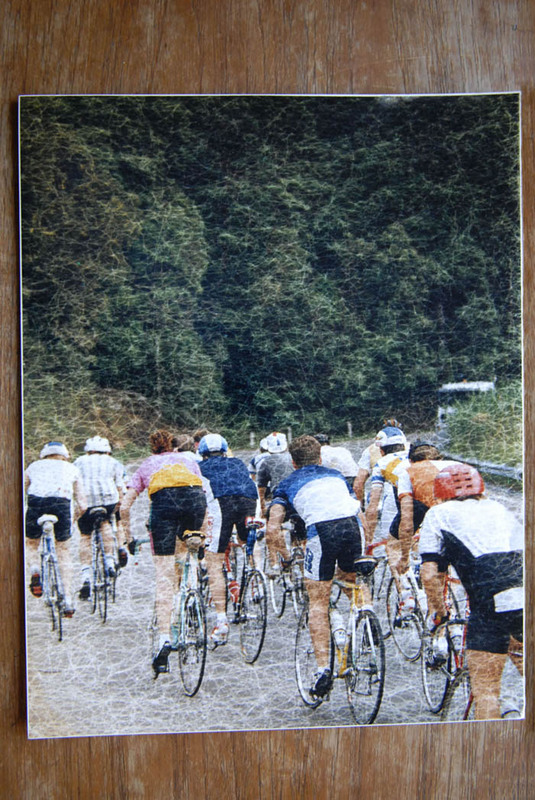 Ken Maynard's 1975 interpretation of cycling bunch madness. At least one Brisbane tradie is so overwhelmed by the increase of cyclist numbers on Brisbane roads, he says he’s accidentally run over a few of them. When my mate Bill showed up late for a ride one morning he had blood pouring out of a cut on his arm. Bill was clearly still arced up when he told us he'd been riding in a cycle lane then the next thing, whack, he was hit from behind by a ute driving tradie. When Bill picked himself up, the tradie had pulled over in his ute and was ready to have a go, so Bill got a bit angry and started punching the guys mirror, then the tradie leant out the window and yelled,“Whenever I hit one of you cyclists I can’t figure out why you always have to get so angry!” Implying that running over cyclists was a common occurrence for this driver. There’s no excuse for the tradie’s behaviour, but you can understand his frustration when sometimes even on a bicycle you are forced to use the wrong side of the road to get safely around some of these meandering bike riding packs. You see them all week long, bunches rolling along the road strung out like lost sheep. It’s mayhem in there, riders who don’t know how to follow a wheel, hold a line, point out obstructions or wave one another round parked cars. Riders who panic and crash just because someone else crashes near them. Some take a tumble by overlapping wheels or this, I even witnessed a crash where a rider slammed into the back of a parked car simply because he wasn’t looking where he was going. Some riders will half wheel their ride companions. The fundamental concept of pointing out holes is either forgotten or so over stated, the deafening sound of “hole” is repeated at the slightest sign of a small depression in the road, somewhere in between the screaming or silence would work best. Cycling in a group like this can't be enjoyable and defeats the purpose of having a fun day out on a bike. One friend of mine who's never raced but has ridden socially for about thirty years puts it this way, "I don't ride in bunches with cyclists that I don't know, riding in these bunches is the quickest way to have an accident!" A pack of wolves shows more team spirit than some of these group rides where a puncture now means ride home alone, take a shortcut to the coffee shop, or fix it in a jiffy and chase. That works if everyone else is up for it or you join a ride like Zupps or a race, then of course it’s okay to go hell for leather. But it seems that some riders can’t tell the difference, thinking that the only purpose of riding in any bunch is to find a group to pit themselves against. The problem exists today because a large number of riders don't race, but see any bunch ride as an outlet for something similar. Another new and dangerous anomaly is the novice group stopped by the side of the road, when it comes time to move off, some of these riders are so focused on looking at their pedals while clipping in, they forget that other vehicles exist on the road, suddenly swerving out into traffic without looking. If these riders were taught to ride properly, they’d be able to manage clipping into their pedals without staring at their feet and instead use their eyes to take a quick glance behind, to see if it was safe to move off. This is one example where the safety of other road users including fellow cyclists, is compromised. On more than one occasion, I've been forced to take evasive measures just to avoid some of these bunches or even individual riders who simply ride out into traffic without looking. I often hear cyclists complain about the attitudes some motorists have towards us. This is a two way street and it should begin with more riders taking responsibility for their own actions. Sure there are drivers out there who will never see cyclists as valid road users, there's nothing we can do about that type of road user, they've always been there. Common sense is free and we'd all be better off if some riders used it a bit more often. Bunch riding requires a cooperative effort with a group of skilled riders who recognise the potential dangers of bike riding and are able to collectively and smoothly ride together for the benefit of the group and other road users. Melbourne Athletic Club had a cycle track for penny farthings at their gymnasium. Tuition for beginner riders at indoor venues was common during that era. Let’s step back a few years. In the first Australian cycling boom of the 1890’s bicycle touring clubs in Australia played an important role in social riding and educating riders, through organised rides. Many touring club rides were conducted on dirt roads in rural Australia to popular weekend destinations like the Jenolan caves, city clubs taking to the country. Right now there’s a swing back in that direction, on the back of the trend in the USA, many riders are talking about building up a gravel grinder and hitting the dusty Australian bush tracks, just like the bicycle riding shearers and miners of the early twentieth century. Before the touring clubs indoor riding schools were popular, Melbourne had an indoor track at the Melbourne Athletic Club, around the edges of their gymnasium at 184 Exhibition Street. Indoor riding schools were popular right from the first days of the Dandy Horse. An article in the February 1953 edition of The Australian Cyclist, referred to the Ruby Cycling Touring Club which eventually incorporated the Carlton Amateur club as a forerunner to the formation of the racing club. “It is an odd fact that most of the present racing clubs owe their origin to touring clubs which were very widespread in the days before many of the gentry took to automobiles.” In the same edition of The Australian Cyclist Jack Fitzgerald offered coaching lessons via correspondence. Ruby Cycling and Touring Club led to the formation of the Carlton Amateur Cycling Club. Touring and group rides existed throughout the twentieth century but in nowhere near the same numbers as the late 19th century. For most of the twentieth century the main form of group riding existed with bike racing clubs. Club rides and weekday training rides plus racing, were the most obvious places to learn bunch riding techniques. There were a few intrepid adventurers out there on the margins who didn’t race yet were comfortable with the idea of their steel bikes and woollen garments, or even plus two’s. A century of wool clad bike riding on old steel, not for the masses. By the last quarter of the century bike riding wasn’t fashionable and you were more likely to have bananas, bottles, tacs, you name it, thrown at you from passing cars. There was a blip on the radar with a minor cycling boom in the 1970’s, but that didn’t translate into the cafe culture we know today, Aussies were for the most part still tea drinkers back then. What followed in the 1980’s laid the foundation for cycling in Australia as we know it today. Brisbane Blasters bunch ride, left Toowong library every Saturday for either a north side or south side loop around Brisbane's suburbs. Triathlon and mountain bike riding began to take off in the 1980’s. Poles apart in skills, one group accustomed to riding in a straight line and the other highly skilled at maneuvering a bicycle on rough terrain. Neither necessarily suited to bunch riding, but they didn’t have to. Bike messengers, dare devils on city streets have been tearing around cities almost since bikes began, ultimately contributing to the fixie culture of today. These aspects of cycle sport were crucial in attracting a larger number of cyclists into the fold. That was the first real phase of change and it was the right time for the Brisbane Blasters to form with John Whip’s vision for mentorship, not only in racing but bunch riding for the everyman. From John Whip’s idea the “Get Outa Brisbane Ride” was created. Anyone could front up at the Toowong Library and learn to ride in a bunch. This was the first time I remember riding together with triathletes and mountain bike riders alike. Before that the only riders I ever trained with were racing cyclists. There were a few concepts on the Blasters Get Outa Brisbane rides that helped for the most part keep everyone upright. If you were new you were welcome, there was always an experienced rider to help you learn the ropes. At the extreme end if you constantly posed a potential danger to other riders some of the senior riders would give you an ear full, some new recruits never came back and that was okay, the bunch remained a safer place that way. There were two riders who were nicknamed Death One and Death Two, if you were smart they would be somewhere else in the peloton, you didn’t ridenear the “Death Twins”. For some reason Death One and Death Two kept coming back week after week, perhaps they enjoyed the abuse! The thing about the Death Twins was they never gave up and they were typical of the riders who just wanted to ride a bike, but had nowhere else to learn, they were like pioneers for this new era of bunch riding. The adjunct to the Saturday rides was the Australia Day ride, another of the rides Whip promoted for the benefit of anyone who wanted to ride. Each Australia Day you’d head up to Mount Glorious on your road bike or on the trails on a mountain bike. One story I never forgot was Richard, I think it was his first ride ever or close to it, he reckons it nearly killed himbut he completed the entire ride all the way up the mountain and back. Ever since that day when Richard almost perished on the mountain, he's been riding, and still out there now nearly thirty years on. Another pioneer rider typifying the new type of recreational cyclist to come. Before coffee culture and bikes morphed into an espresso coloured kaleidoscope on every corner, you went on a bunch ride then went straight home, no coffee stop. There weren't many cafes serving descent coffee in Brisbane in the 1980's, it was changing though. A lot of rides ended up at The Cat and Fiddle Deli at Toowong, then one day a group of splitters announced they'd headed off to their own secret coffee haunt, the Dolce Vita at Milton. I reckon there have been bike riders hanging out at La Dolce Vita almost every day since then. The same thing happened in Sydney when Bar Coluzzi became a drawcard for bike riders, with riders like John Sunde and Co kicking that one off. From there the whole thing exploded. The Australia Day ride, another Brisbane Blasters initiative to help foster cycle sport and group riding activities in Brisbane. For most of the twentieth century, one of the best places to learn bunch riding skills was with a bicycle racing club and this option is still available today. You can’t get better than a race for the perfect environment to enhance these skills. Club riding and racing is not for everyone though. There is plenty of opportunity to learn, including courses by AustCycle and NCAS accredited coaches. There are many qualified ex elite riders offering tuition from beginner level skills courses right up to pro level training programmes. Last, the easiest one of all, common sense .... it's free. You just have to find the right fit. The editor of the London Bicycle Gazette summed it up in 1880 and his words still ring true today.